The new Joker movie doesn't have DC fans divided so much as perplexed. When photos began to emerge from set, they looked like Joaquin Phoenix on any average day, and everyone made fun of the mundane nature of the photo shoots. Even Conan got in on the Joke with a video showing just how ordinary Joker's life was in this DC spinoff that is firmly set in its own universe. Since then, we've seen Joaquin in his Joker make-up. And it still left fans feeling perplexed. Today, we get a few more surprises, a few of which are a little yawn inducing. But that seems to be the point. Director Todd Phillips, who is perhaps best known for his Hangover trilogy, has been sharing photos of his cast that look like he caught his actors on an off day, That trope continues here with a first look at Deadpool 2 and Atlanta breakout star Zazie Beetz in costume. She looks like she woke up at a seaside resort, threw on a shall, and shuffled off downstairs to stare at the ocean while sipping tea. Of Zazie's addition to the cast, the director says this. "So excited to be working with @zaziebeetz. Joker." 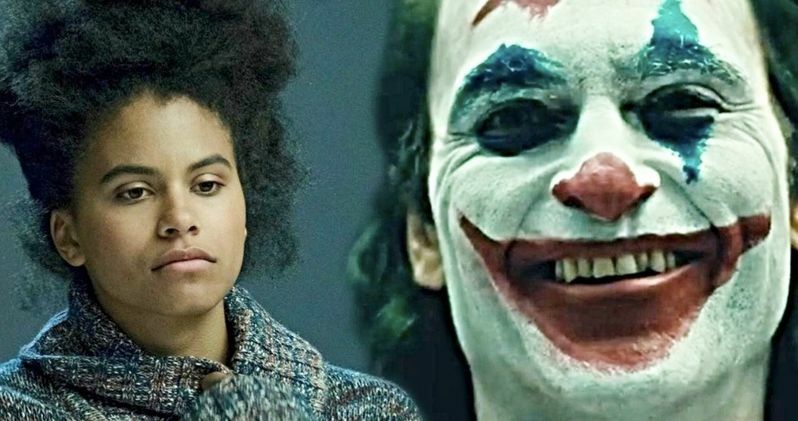 Just before the weekend, Todd Phillips shared a first look at Joaquin Phoenix in his full Joker make-up, assuring fans that Arthur Fleck will be transforming into the Clown Prince of Crime. It was a 360 from Jared Leto's tatted up and douchey looking Joker from Suicide Squad. Joaquin's Joker looks like he stepped off that infamous Mr. Bungle album cover from 1991. Many fans claim this was just a camera test, and this isn't what he'll look like in the finished movie. They spoke too soon, and are wrong. TMZ has captured some video of Joaquin Phoenix in action as Joker, and it's still the same make-up design that was introduced in that camera test. Gone, it seems, is the origin story Jack Nicolson got for the character in Tim Burton's Batman. The Clown Prince appears to be applying his own makeup these days. We see Phoenix here for the first time in his iconic purple suit and green tie. He steps off a subway, pulling off a clown mask to expose the real clown underneath. There is chaos. There is madness. This looks like a cheap and gritty Joker movie. It's already been established that Joker will take place in Gotham City, and here, Arthur looks to be having fun on an NYC subway uptown, turning all smiles as his crime wave gets underway. The imagery, shot on a video camera by a TMZ spy who somehow got pretty good access to the set, looks devilishly creepy.